This study finds that the renewalist movement is having a major impact on Hispanic Christianity. Indeed, the influence of renewalist Christianity in the U.S. appears to be even more profound among Latinos than among non-Latino Christians. For example, the study finds that more than half of Latino Protestants can be classified as renewalists, meaning that they either belong to traditional pentecostal denominations or describe themselves as charismatic or pentecostal Christians. 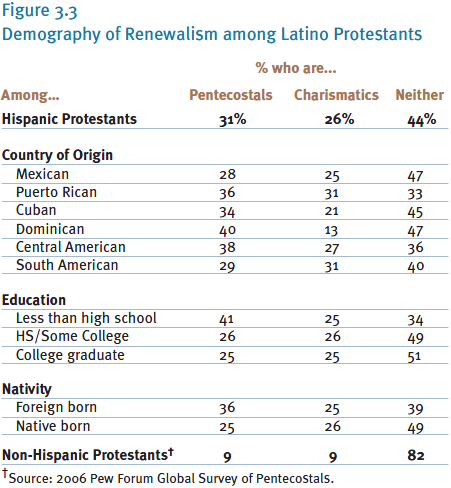 By contrast, the 2006 Pew Forum Global Survey of Pente – costals found that fewer than one-in-five non-Latino Protestants qualify as renewalist by those definitions. The overall influence of renewalist Christianity is clearly evident in specific religious practices and beliefs. For instance, pentecostals are more likely than most other Christians to read the Bible regularly, share their faith with nonbelievers, take a literal view of the Bible and express belief in the “prosperity gospel” that God blesses those who have enough faith with good health and financial success. Hispanic Catholicism also appears to have been dramatically affected by the renewalist movement. Most significantly, a majority of Latino Catholics describe themselves either as charismatic or pentecostal. By contrast, only about one-in-ten non-Latino Catholics accepts those labels. The extent to which the renewalist movement appears to have made significant inroads among Latino Catholics was so striking in the initial survey that it prompted a follow-up survey of Latino Catholics to explore the phenomenon more fully. The call-back survey provides a more nuanced understanding of the renewalist influence on Hispanic Catholicism. Charismatic Latino Catholics are distinct from other Latino Catholics in certain ways — for example, they are more likely than other Catholics to participate in groups where prophesying or speaking in tongues occur, and they are more likely to have experienced or witnessed an exorcism. However, those differences are often fairly modest. 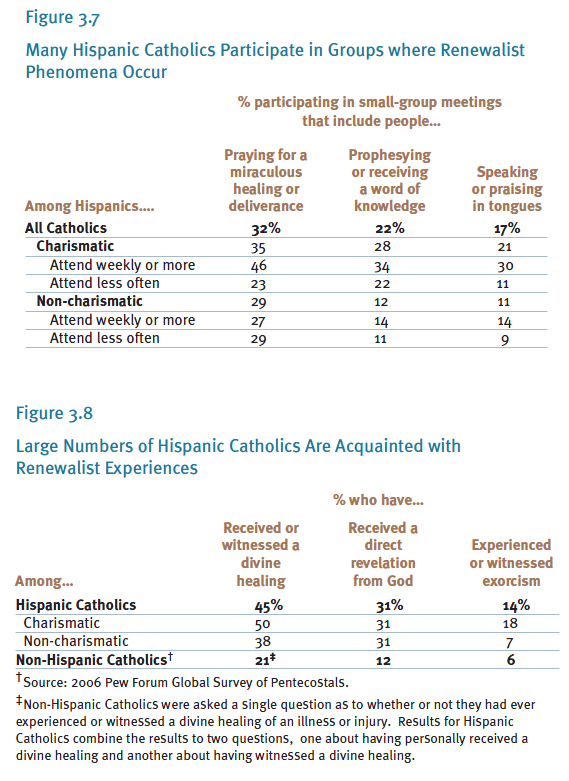 That may be due, at least in part, to another striking feature of Hispanic Catholicism: According to the survey, even Latino Catholics who do not describe themselves as charismatic or pentecostal are more likely than non- Latino Catholics to report having experienced or witnessed supernatural practices such as divine healings or revelations from God. While the influence of renewalism is broadly relevant in Hispanic Catholicism, the call-back survey also found that Latino Catholics nevertheless remain very much Catholic. Indeed, renewalist practices seem to have been incorporated into Hispanic Catholicism without displacing Catholic identity. Although Hispanic Catholics as a whole are relatively traditional in their Catholicism, charismatic Catholics are even more likely than non-charismatic Catholics to pray the rosary and serve in their parishes. 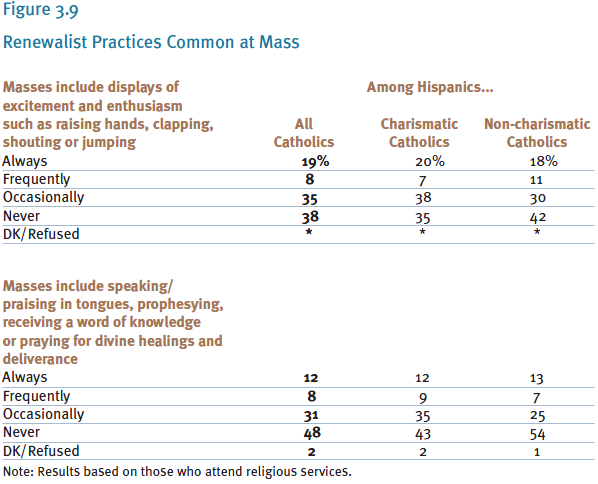 Overall, the findings thus suggest that Hispanic Catholics practice a distinctive brand of Catholicism, one that incorporates many of the beliefs and behaviors most commonly associated with pentecostal or renewalist Christianity, while at the same time upholding the main features of traditional Catholic teaching. Given the growth in the proportion of U.S. Catholics who are Hispanics, these findings underscore the ways in which Latinos are helping to shape U.S. religious institutions. This chapter discusses the impact of renewalism on the practices and beliefs of Latino Christians, as well as the demographics of Hispanic renewalist Christianity. Drawing largely on the results of the follow-up survey of Catholics, it then assesses in greater detail the impact of renewalism on Hispanic Catholicism. Scholars, journalists and other observers use a number of terms to refer to the renewalist movement as a whole as well as to its various currents or subgroups. In this report, terms are narrowly defined based on responses to several key survey questions. The term “pentecostal” is used throughout this chapter to describe those who belong to specifically pentecostal denominations, such as the Assemblies of God or the Assembly of Christian Churches. The term “charismatic” is used to describe Christians (including Catholics) who do not belong to pentecostal denominations but who nevertheless describe themselves as either charismatic or pentecostal Christians. The terms “charismatic Catholic” and “charismatic Protestant” are used to describe Catholics and Protestants who meet those criteria. Although in the rest of the report Jehovah’s Witnesses, Mormons and Orthodox are grouped together under the label of “other Christians,” in this chapter they are included in the umbrella category of Protestants. “Renewalist” is an umbrella term that refers to both pentecostals and charismatics as a group. Latinos identify with renewalist Christianity at significantly higher rates than do non-Hispanics. Among the more than two-thirds of Latinos who are Catholic, a majority (54%) are charismatics, meaning they describe themselves either as charismatic or pentecostal. The extent of renewalism among non-Hispanic Catholics is small by comparison, at slightly more than one-in-ten. Among Hispanic Protestants, an even larger proportion (57%) identify themselves in these terms; 31% are pentecostals and 26% are charismatics. Again, the contrast to the non-Hispanic population is stark: less than one-in-five non-Hispanic Protestants are renewalists. The influence of the renewalist movement in the Hispanic population can be seen in some specific measures of religious practice and belief. These go beyond traditional pentecostal practices such as speaking in tongues. For example, Latinos who are pentecostal Protestants, more than any other Latino group, say they share their faith with others at least weekly (70%), and even more (80%) say they read the Bible at least once a week. For the most part, Latino Catholics engage in these practices less often than do other Christians, although evangelism and Bible reading are more common among charismatic Catholics than among other Catholics. Latino pentecostal Protestants and charismatic Catholics differ significantly from their non-renewalist counterparts not only with respect to certain practices but also with respect to several important measures of religious belief. Strong majorities believe that Jesus will return to Earth in their lifetime, for example. They also are more likely to believe that God will grant financial success and good health to the faithful, although majorities of all Hispanic Christian groups believe that. Among Latino Protestants, three-quarters of pentecostals (75%) and two-thirds of charismatics (67%) hold a literal view of the Bible. 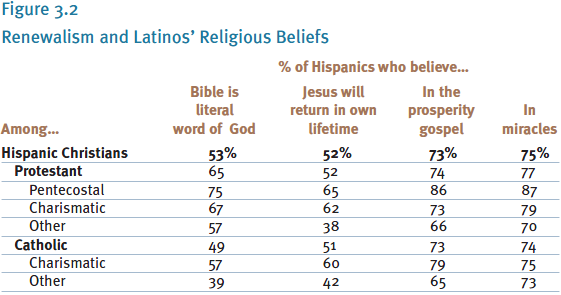 Similarly, Latino charismatic Catholics are nearly 20 percentage points more likely than are other Latino Catholics to be biblical literalists (57% vs. 39%). Among Latino Protestants, nearly one-third (31%) are members of classic pentecostal denominations and one-fourth (26%) are charismatics. By these measures, Hispanic Protestants are substantially more renewalist in their orientation than are non- Hispanics. Indeed, among non-Hispanic Protestants, fewer than one-in-ten are pentecostals, and a similar number (9%) are charismatics. The vast majority (82%) do not identify with the renewalist movement. The degree of renewalism among Latino Protestants varies somewhat by country of origin. For example, 67% of Puerto Rican Protestants identify themselves in renewalist terms, compared with 53% of Mexicans. Similarly, Hispanics with less than a high school education are somewhat more likely to be pentecostal than are those with higher levels of education. Like other Latino Christians, Latino Catholics identify with renewalist Christianity in large numbers. Indeed, a majority (54%) of Hispanic Catholics are charismatics. By these measures, Latino Catholics are more than four times as likely as non-Latino Catholics to identify with renewalist Christianity. As is the case with Latino Protestants, Latino Catholics who identify with the renewalist movement also are more prevalent among those with lower levels of education. A majority (59%) of Latino Catholics without a high school education, for example, are charismatics, compared with 39% among college graduates. 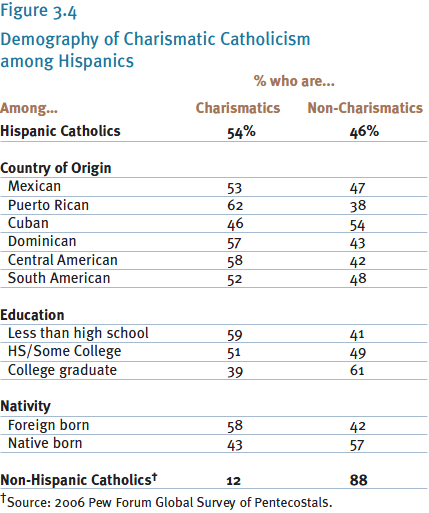 Foreignborn Latino Catholics also are much more likely (58% vs. 43%) to be charismatic than are native-born Latinos. As noted above, a majority of Latino Catholics describe themselves as charismatic or pentecostal, while only a small minority of non-Hispanic Catholics do. This suggests that the renewalist movement, with its emphasis on an intense personal experience with God and on the role of the Holy Spirit in the lives of believers, is an important and distinctive characteristic of Hispanic Catholicism. Over the past few decades, charismatic practices have become a growing presence within the Catholic Church in the United States and around the world. But to what extent have Latino Catholics adopted these charismatic teachings? To explore more fully the prevalence of renewalism among Latino Catholics, 650 Catholics from the original survey (both self-described charismatic Catholics as well as other Catholics) were contacted again and asked a series of questions about their experiences with renewalist groups and practices. The results of the recontact survey confirm that while Latino charismatic Catholics differ from other Latino Catholics on several renewalist measures, these differences are often relatively modest. Nonetheless, it is clear that the charismatic renewal movement has penetrated Hispanic Catholicism in significant ways. As a result, many Latino Catholics — self-described charismatics as well as others — report holding beliefs and having religious experiences that are typical of pentecostal or spirit-filled movements. Latinos who are charismatic Catholics do not appear to be discarding traditional Catholic teachings in favor of pentecostal Protestant doctrines, however. Rather, they seem to be incorporating renewalist practices without displacing Catholic identity and core Catholic beliefs. In fact, Latinos who are self-identified charismatic Catholics tend to be rather traditional in their approach to the Catholic faith. Although charismatic practices and beliefs are fairly widespread among Latino Catholics, formal participation in Catholic charismatic organizations is much less common. For example, only 15% of Latino charismatic Catholics say they ever participate in Catholic charismatic renewal organizations such as Charisma in Missions (Carisma en Misiones) or The Sower (El Sembrador). 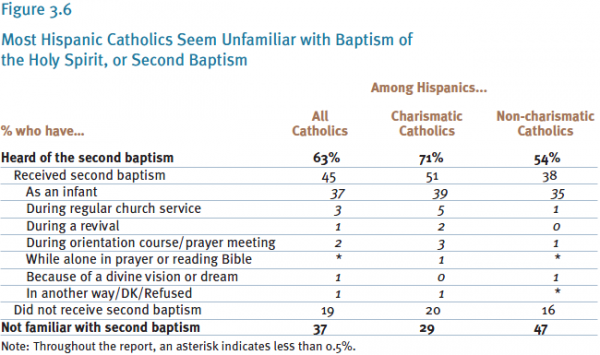 Just as very few Hispanics say they are part of formal Catholic charismatic organizations, few also show a familiarity with the baptism of the Holy Spirit (also known as the second baptism or the second blessing), which is central to renewalist theology. At the second baptism, individuals are said to experience a profound indwelling of the Holy Spirit, an occurrence that is often manifested by speaking in tongues or some other supernatural sign. This is typically said to occur in young adulthood or later. Most Hispanic Catholics (63%) say they are at least somewhat familiar with the concept of the baptism of the Holy Spirit. Less than half (45%), however, say they have received the second baptism. And of these Catholics, the vast majority (37% of all Hispanic Catholics) say they received the second baptism as an infant. This strongly suggests that what they have in mind is the Catholic sacrament of baptism, rather than the baptism of the Holy Spirit as understood in pentecostal circles. While participation in formal charismatic organizations is relatively rare among Latino Catholics, participation in small groups where distinctively renewalist phenomena take place is fairly common. One-in-three Hispanic Catholics, for instance, including 35% of charismatics and 29% of non-charismatics, say they participate in prayer groups or other small-group meetings that include people praying for miraculous healing or deliverance. Moreover, one-in-five Hispanic Catholics (22%) participate in groups where prophesying or receiving a word of knowledge from God takes place, and nearly as many (17%) participate in small groups where people speak or pray in tongues. Participation in both kinds of groups is more common among charismatic Catholics, especially those who attend church regularly, than it is among non-charismatic Catholics. The widespread familiarity of Latino Catholics with renewalist practices is further evidenced by the large numbers who report having personally experienced or witnessed divine interventions in daily life. More than one-in-three (35%), for instance, say they have personally witnessed the divine healing of an illness or injury, and nearly as many (29%) say that they themselves have been divinely healed from an illness or injury. In total, nearly half of Latino Catholics (45%), including 50% of charismatics and 38% of other Catholics, say they have either received or witnessed a divine healing of an illness or injury. Reports of having received a direct revelation from God are less common, though nearly one-in-three Latino Catholics (31%) say they have experienced that. Fewer Latino Catholics (14%) say they have experienced or witnessed the devil or evil spirits being driven out of a person; however, the figure is almost three times as high among charismatics (18%) than among other Catholics (7%). For the most part, Latino Catholics appear to be more familiar with these types of renewalist experiences than do non-Latino Catholics. Comparisons with the 2006 Pew Forum Global Survey of Pentecostals indicate that Latino Catholics are more than twice as likely to be familiar with divine healings, revelations from God and exorcisms as are their non-Latino counterparts. The study also finds that the Masses attended by Latino Catholics often exhibit the kind of exuberant atmosphere that is more characteristic of pentecostalism than of traditional American Catholicism. Among Latino Catholics who attend church services, for example, more than six-in-ten (62%) say that the Masses they attend at least occasionally include displays of excitement and enthusiasm such as the raising of hands, clapping, shouting or jumping. A slim majority (51%) of Hispanic Catholics also report attending Masses that at least occasionally include people speaking or praising in tongues, prophesying, receiving a word of knowledge or praying for divine healing. Seeing people at Mass speaking in tongues or engaging in other activities typical of pentecostalism is common among a majority of Latino charismatic Catholics (56%), but even among other Latino Catholics nearly half (45%) also report observing these phenomena at Mass. These results make it clear that certain practices associated with renewalist Christianity indeed are widespread throughout Latino Catholicism. Although especially common among self-identified charismatic or pentecostal Catholics, they are present as well to a significant degree even among Latino Catholics who do not personally accept the renewalist label. As noted above, the adoption of many key features of renewalist Christianity by Hispanics does not appear to be undermining their commitment to a more traditional or orthodox Catholicism. On the contrary, Latino Catholics generally tend to be quite devoted to the church and are traditionalist in their practice of Catholicism. The overwhelming majority of Latino Catholics (74%) say they could never leave the Catholic Church. One-infive (21%), however, admit that they could imagine the possibility of leaving the Catholic Church someday. But despite their greater acquaintance with practices associated with pentecostal Protestantism, Latino charismatic Catholics are no more likely than non-charismatics to say they could imagine leaving the Catholic Church someday. Large percentages of all Latino Catholics — charismatics and non-charismatics alike — embrace their church’s traditional beliefs and practices. Nearly nine-in-ten Latino Catholics, for instance, believe that in Mass the bread and the wine become the body and blood of Christ — a core Catholic belief. More than eight-in-ten say that they pray to the Virgin Mary. A sizable number of Latino Catholics (43%) also say they pray the rosary at least once or twice per month and 43% go to confession at least once or twice per year. Slightly larger shares of charismatic than non-charismatic Catholics report taking part in these activities, but the differences are quite modest. The survey asked Catholics whether or not they serve in any of five roles in their parish — lector, Eucharistic minister, choir member, parish council member or leader of a small group or ministry. While the rate of participation in any single one of these roles is fairly low (ranging from 4% who are choir members to 12% who serve as lectors), more than one-in-five churchgoing Latino Catholics (22%) serves in at least one of those roles. Latinos who are charismatic Catholics, however, are nearly twice as likely as are other Latino Catholics (28% vs. 15%) to serve their parishes in those ways. Although many Latino Catholics appear to have absorbed renewalist beliefs and practices that are more characteristic of Protestant pentecostal and evangelical churches, relatively few Hispanics say that they regularly attend church services at those churches. Overall, 10% of all Latino Catholics, and 12% of Latino charismatic Catholics, report attending evangelical or pentecostal services at least a few times a year. A final indication of the extent to which Latino Catholics have retained traditional Catholic practices and beliefs despite the influence of renewalist ideas is reflected in their lack of familiarity with the rapture of the church, a commonly held belief among evangelical and pentecostal Protestants. Only one-in-three Latino Catholics say that they have heard at least a little about the teaching concerning the rapture, and fewer still (6%) say they believe in it. The vast majority of Catholics either are unfamiliar with the rapture (69%), have not heard enough about it to say whether or not they believe it (21%) or explicitly reject belief in the rapture (5%).